My guest reviewer is author, shaman, and energy healer, Carol Woodliff. She is one several wonderful people I met through the Next Top Spiritual Author competition held a couple of years back. Jacob Norby is another of the authors who has become a friend. Here Carol offers her review of Jacob’s just released novel, The Divine Arsonist, a Tale of Awakening. 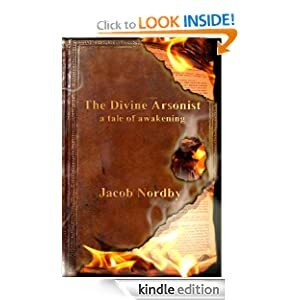 The Divine Arsonist by Jacob Norby is the story of a businessman who worked hard to climb the ladder of success only to have something whisper to him that perhaps there was something more to discover. This is his journey of discovery told in a blend of the personal story and fiction. It immediately spoke to me of the question: When do we start dreaming a new dream for ourselves and our world? The old ways are burning us out. That’s where Jacob is at the beginning of his journey. There are so many elements of a shamanic journey, vision quest or hero’s journey from old mythology: meeting spiritual guides, being challenged to endure rites of passage, time in the wilderness, facing the shadow and opening to all the levels of reality beyond our day-to-day “get it done” consciousness. The writing is luscious, descriptive and an easy read. I could have easily read it in one sitting but I forced myself to turn off the light at night and savor it over the course of several bedtime reading sessions. There are beautiful teachings that you want to grab the highlighter to remember. Jacob’s journey toward finding his light is an invitation or challenge to go on your own journey, to claim your own light. It is a tale that reminds us that life is short and that we are choosing the world we live in right now with each thought and each action we take. It is a story that reminds us that sometimes we have to let go of everything that we think we know to become the person we came to earth to be. Even though I’ve had my own awakening moments, Jacob’s writing made me want to commit to living them on an even deeper level. Isn’t that what we want a spiritual book to do? I highly recommend Jacob’s book. I hope you give it a read. You can buy The Divine Arsonist on Amazon either in book form or Kindle. Jacob Nordby is an author, speaker and personal transformation mentor. He is published with Jack Canfield in “Pearls of Wisdom: 30 Inspirational Ideas to Live Your Best Life Now“, with Dr. Bernie M. Siegel in “The Thought That Changed My Life” and is currently writing, “The Cosmic Compass: An Adventure of Inner Guidance”. Mr. Nordby is the founder and publisher of the popular e-magazine site, YourAwakenedSelf.com. Dana, I am very grateful that you shared this. As a fellow author, you know how much it means to see the word spreading. Jacob is a truly amazing story teller. Real magic in these pages.